I have begun the revision of For Want of a Father, this year’s NaNo novel. Scenes are outlined through page 100. I have made notes on needed changes using the CASTS system I learned from Nancy Pickard at a workshop several years ago. The CASTS system involves looking at each scene and checking for Conflict, Action, Suspense, Turn, and Sensory. You can read more about CASTS at Writer Unboxed or watch Libby Hellmann’s video explaining the system on her site. However, I’m tired of outlining. I want to get to work on the actual draft. Therefore, I am attacking the first chapter and point of view. There are two point of view characters in the novel: those of sisters Cordelia, 17, and Lucy, 13. I would tell you more, but that might color your judgment of which would be the better beginning. There will be a poll at the end, so please vote for the beginning you believe is more effective. I hovered around the hotel check-in desk, waiting for Cordelia to do her job and sort the mail. She knew I was expecting my weekly letter from my brother Ambrose, but she always made me wait, sorting through every piece: the regular boarders’, Grandma’s, Aunt Hannah’s, and business mail addressed to the hotel before handing me my letter. She was being spiteful because Ambrose addressed the letter to me instead of her. I whisked my feather duster over knickknacks that lined shelves along the walls, sneaking looks at her as she put letters in piles and slid some into the row of cubbyholes behind the desk. She stopped, frowned, and lifted a small, letter-sized package about a half-inch thick. “For you, Lucy,” she said, holding out the small parcel to me. I unfolded the letter and scanned it. “Pa wants me home. I’m to go on the next stage. This money is for my fare and anything else I need. I’m going home!” My deepest wish had come true at last, and I wasn’t going to let anyone talk me out of going. Lucy was hanging around the hotel lobby like she always did on the day the mail stage came through, pretending to be working while sending me dirty looks, thinking they would make me sort the correspondence faster. I always gave her the letter from our brother Ambrose as soon as I spied it, but because I didn’t make it a priority and fish it out of the pile first thing, Lucy spent every mail day madder at me than usual. I sorted all the letters and put them in the appropriate boxes behind the check-in desk for pickup; none were from Ambrose. Lucy gave me one of her sideways looks, a look that said she thought I was keeping the letter from her on purpose. In a minute, she would be marching across the room demanding to know where her mail was. I met her eyes and shrugged, turning my palms up and shaking my head as I reached for the small, half-inch thick parcel I had put to one side, thinking it would be easy to hand over if anyone called for it while I was sorting the other mail. When I saw it was addressed to Lucy, I knew she would think I kept it from her on purpose, that somehow I was jealous because Ambrose wrote directly to her. After all, I was only his half-sister. She dropped the duster and raced across the room. “It took you long enough.” She ripped the package from my hand and tore at the wrapping. Something thudded to the floor. She stooped to pick it up. “A twenty dollar gold piece!” Her eyes widened in excitement as she scanned the letter. “Pa wants me home!” Her voice was filled with pure joy. At last, Lucy had gotten what she dearly wanted. Somehow, four years of separation had allowed her to forget what a mean man her father was. I have been trying to insert my first poll in this blog post and am having issues with the technology. If a poll does not open correctly below, please make a comment and let me know which point of view you would choose to begin the second book in the Pierce Family Saga: Lucy’s or Cordelia’s. Thank you for your vote. 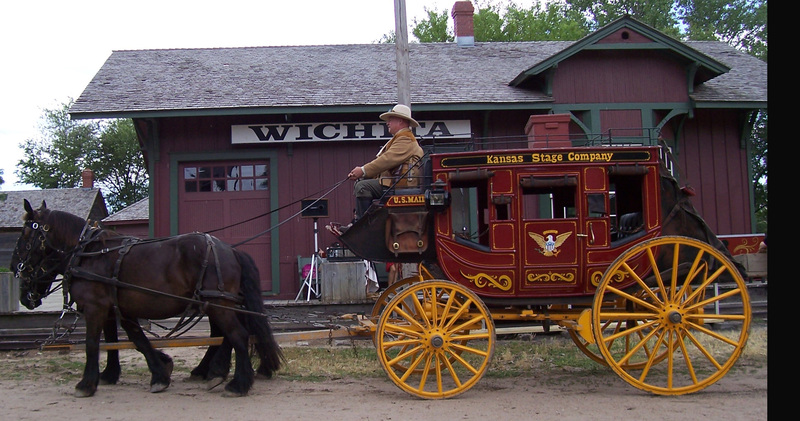 Okay, so it’s not the Old West, but this picture of a stagecoach taken at Wichita’s Cowtown is the best I have. Question: “What do stagecoaches have to do with NaNoWriMo word statistics? Answer: I did what NaNo writers are advised not to do. Research. While zipping toward my word count last week, I became obsessed with the size of Old West stagecoaches and what they would hold. Cordelia, one of my main characters, is heading to Denver on the Pikes Peak Express in 1859, and she has some annoying travel companions. How many? More than I had originally planned. You see, based on the western movies I have watched, I thought stage coaches had two seats. It turns out they had three. Each seat held three passengers, so the coach could hold nine. Also, up to three passengers could ride on top with the driver and shotgun guard. The amount of mail and other freight packed into and on top of the coach often left passengers scrunched against each other, making Cordelia’s approximate twelve-day ride from eastern Kansas to Denver uncomfortable to say the least. If you are interested in learning more about stagecoaches and what it was like to ride in one, check out History of the Stagecoach and Stagecoach Service in the 1860s. As a bonus, check out this map of nineteenth century Kansas trails, which includes the Express route through Kansas Territory in 1859-1860. Question: So what about your NaNo statistics? Answer: I’m proud to say that I’m keeping up with the daily word count. I’m actually a little ahead with 20,523 words as of this morning. Question: Weren’t you taking two online courses at the same time? What about those? Answer: I’m keeping up with the fiction MOOC, refining scenes from my NaNo novel for my assignments. When it comes to Blogging 201, I’m still at the starting gate. However, I am down to the last lesson in the MOOC, so I’m planning to spend the end of this week making blog improvements. What? You say it’s about time?